Ever since I was a kid I was fascinated by flight. Who isn't, right? I've read tons of books and watched countless hours of programming regarding the NASA space program. To me, it's just fascinating that human beings have been able to build craft to safely launch astronauts to the moon and back, and hopefully beyond someday. When I was in 5th grade, I was one step closer to becoming an astronaut when there was a competition being held in our school. Essentially, we would simulate a rendezvous of mock astronauts from our school and meet up with astronauts with another school. It really was a neat event to help promote the space shuttle program, team building, planning, etc. I remember the interview process with the principal at our school. I thought I aced the interview and was guaranteed the spot, then as I was leaving the office, I saw my sister waiting to be interviewed. Damn! I'm doomed - there is not way they are going to have a brother and sister on the same space shuttle. But anyway, I was chosen as an alternate and put on as part of the support crew, while my sister was going to be on the "shuttle". Essentially, the "Space Shuttle" was a school bus painted all white, with the appropriate insignia, and 3 garbage cans mounted to the back door emergency exit. When it was time to "blast off" the bus driver drove away, while fire extinguishers simulated rocket exhaust. I looked pretty cool, even though it was kind of cheesy. This was an all day event encompassing the 3rd, 4th and 5th graders. There was a mission commander, scientists, payload, mission control, etc. The mission control room was actually pretty cool. It had some ham radio operators in it with oscilloscopes running, and equipment that would communicate with the other schools and the "shuttle". (I'm not sure how they legally did this since none of the shuttle crew was a licensed ham operator - thus making contact illegal - so they must have just been using the school bus radios and the 11 meter band.) Anyway, it was neat to witness and was broadcast on all the news channels in the Cleveland area that evening. Nothing really came about as a result of my research and dreams of becoming and astronaut, but it's very rare even for astronauts selected into the space program to see actual flight. So I wasn't crushed by any of this. Sure, I had dreams of attending Space Camp in Atlanta or being weightless in a KC-135 aircraft, but it's a pretty expensive scenario to even attempt any of this. It's a shame that Congress is eliminating most of the NASA space program, but I'm excited to see companies like Space-X pick up the slack and move forward. They're doing some really neat research and practical flight. NASA is even giving them clearance to deliver payload to the ISS (International Space Station) and eventually human cargo. I'd love to continue with more flying and would love to get a Single Engine Water rating so I could just fly off, end up in Canada at some remote lake for the summer, but it's just way, way, way too expensive to rent a plane and fuel it now-a-days. Renting a plane back in 1994 cost about $71.00/hour and as you can see from above, you don't get very far very fast. Today it's just not worth the cost. Sure it's convenient, but not very practical. It was a fun adventure and taught me all kinds of things with regards to weather, the earth, aeronautics, division of time and multi-tasking, etc. I highly recommend anybody that has the opportunity to even take a lesson or two, to do it - you'll even get to fly on your first time in the aircraft. It really is breathtaking. One of my favorite flights was flying into South Bend Regional Airport. I felt like king of the world talking with the control tower and landing with the "big-boys" (well at least the commuter jets in Class C airspace), flying over Notre Dame (Rudy! Rudy!) and seeing the Chicago skyline off to the west in the distance. Once I landed, I had them refuel the plane and I went in to hang with the other pilots, but I had no war stories to share, so I'd just sign the log sheet for posterity and be on my way. The only real thing that was an eye-opener was the runway lengths. I was used to landing and taking off from 2,500 to 4,000 foot runways. South Bend however had a runway length of over 8,000 feet long. Since you've got to stay on the center-line of the runway when taking off it made for a little longer of a climb out in a Cessna 152 than I was used to. I also enjoyed the little amount of night flying I did with my instructor. Buzzing around the corn-fields of Bowling Green at night, and me with blinders on, he would take the plane and perform several maneuvers and put the plane into a precarious situation, then say "You have control" and I would "Roger, I have control". Then I would have to put the plane back into normal flight as quickly as possible. He would also simulate electrical failures, "engine outs", graveyard spins, stalls, etc. No inverted flight (as the plane wasn't rated for that, but I'd be game if it was). The Cessna 152 is a pretty tough little plane. There were times we'd probably pulled upwards of 3G's (three times the force of gravity) from maneuvers that we performed and that would really pin you in your seat. I also took mom for a flight, renting a 1966 Cessna 150 (N3964J) out at Medina Airport (1G5), did a couple of touch and go's (to be compliant with the regulations since it was a while since my previous flight), the she climbed aboard, I gave her "the speech" (don't touch the controls, fasten your belts, I'm in command, etc). We took off and let me tell you, this plane was a piece of crap! It had crappy power, manual flaps that you had to pull by hand, and when pulling carburetor heat, the plane would shake violently. It was kinda funny, Mom turned to me and said "Is that normal?" and I said, "No, not really! ", but I can understand. Before renting the plane I checked the maintenance books (like all good pilots do) and the engine time stated that it was due for an over-haul in a few "engine" hours (of which they weren't even aware of - so they made a note for the mechanic). I really hope they did something with that plane...like took it to the junk yard. Overall, I hope Mom had fun. 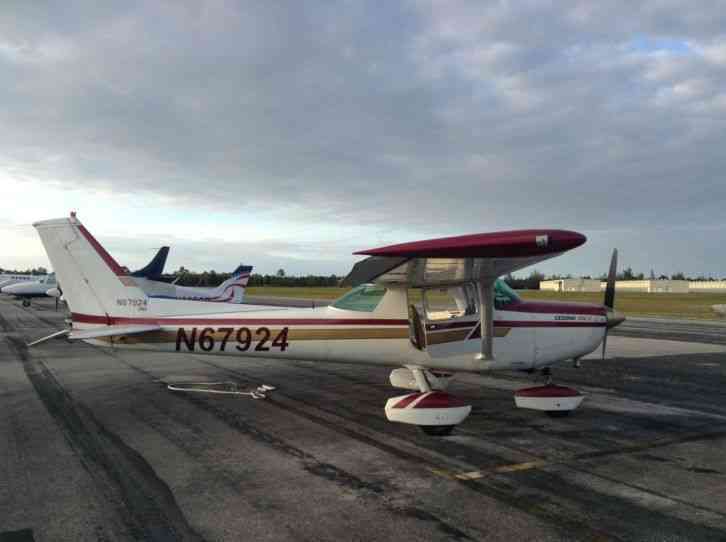 Other than that I've flown a Cessna 172 (that's got some good power for a 4 seater aircraft). Coming back from a corporate meeting in Chicago, our company pilot in 2003 let me fly the corporate Beech C90A (multi-engine turbo-prop aircraft tail number N3030G) with my bosses and co-workers onboard from just west of South Bend to Toledo Metcalf Airport...he turned to me and said, "You want to land this?" and I thought about it, turned around and said "Nah! You do it." So that's the last bit of flying I've done. It's just way to costly to do recreationally. The one thing that you really learn (like it or not) is that you're taking your life and your passengers lives in your hands when you're the pilot in command. You also get to come to grips that you may crash and die, but you're less likely to die in an aircraft than driving to the corner store for milk...plus you get to control your own fate, not some jerk running a red light and killing you at the intersection. One thing I'd like to do more of is model rocketry and remote control aircraft flying. I always used to build the Estes Rockets and launch them, fascinated that essentially a cardboard tube with fins could fly so high, so fast. I'd always forget to put some cotton behind the nose cone and my parachute would melt when the rocket reached apogee and the chute got deployed. Then gravity took over and after a couple of seconds..."Smash!" right into the ground...it was usually destroyed or worse, lost. Some of the serious Amateur Rocket builders spend months building their rockets and mixing "real" rocket fueled engines. They fly so high you actually have to get FAA clearance and make sure the area is clear before launching. I also got a remote control airplane with a mini-gasoline engine. My Dad helped me build it, then we picked a field as a family and went out to fly it. Unfortunately, we never could get that damn engine started. It was one that required you to hook it up to a battery to get a glow-plug hot, then you'd spin the propeller with your fingers to get it to start. It would always start during test phases, but when we'd get to the field for a flight and it never started. About 10 years later, the engine was all seized and gummed up so it got retired to the big airport in the sky. I did get a couple battery powered "park flyers" and those are really fun to fly, but you've got to have real calm days (almost no wind) and also have to judge your battery usage. I found out the hard way. While in a nose-down attitude, the battery was so far depleted that the onboard controller would only let you steer right or left. I guess it did that assuming you're coming in for a landing - why I have no idea. In real aircraft landings you've always got one hand on the control and the other on the throttle (for a possible go-around). But having only left and right is asking for trouble and it was...."Smack!" right into the ground and the propeller broke. I had another model that I would fly in our hosing development before more houses were built. This is where I learned my lesson about calm winds. I would set the plane at full throttle and launch it upwind. The craft performed quite well. Then while flying downwind, to then turn base and land, I wasn't able to maneuver it fast enough and the airplane smacked right into the side of a new house they were building (good thing it was late in the day and nobody saw or heard it), but it pretty much demolished the plane. That vinyl siding is pretty tough! It just stinks since remote control aircraft are a little more temper-mental than real aircraft and at a couple hundred bucks a plane it's not a "cheap" hobby. Yes, I've done this also. In October 1994, a group of us in the Computer Science department at BGSU got together and decided to jump out of a Cessna 182 with a parachute strapped to our backs at the Bradner Airport through SkyDive BG (they have since gone out of business). The experience, although fun and exhilarating is something I've always debated whether or not I'd do it again. Essentially, they crammed about 5 of us into the back of a hollowed out Cessna, took off, and climbed in the airport pattern to about 3200 feet. Since it was our first jump the instructor hooked our primary chutes to the plane (static line). I then climbed out of the plane, hung onto the wing strut, and looked over at him, he gave a thumbs up, then I let go. I then arched my back and you get a whopping 1 second of free-fall, then the static line cord rips your chute open and you control the chute the rest of the way down. It's pretty much fail-safe, and if your chute doesn't open an altimeter rigged charge will fire your main or emergency chute if needed. I just like to have more of a safety net then some bungee cord and a nylon bed sheet. If any of that fails, well, let's just say I hope you like dirt!